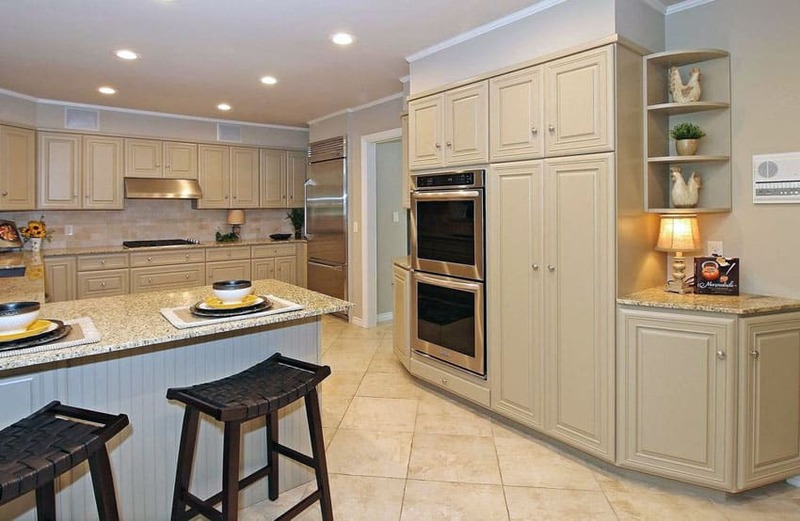 This gallery features beautiful cream kitchen cabinets. For those looking for a traditional style kitchen, the color cream is used to convey a warmness and elegance that many homeowners love. 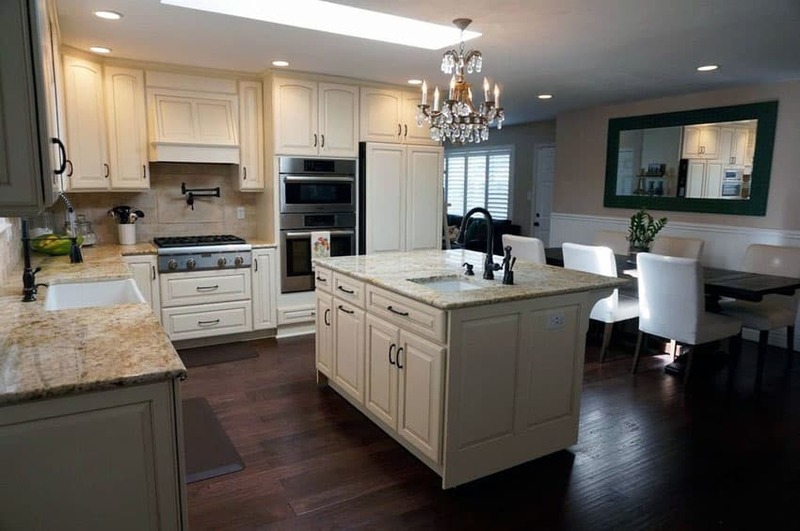 Since it closely resembles white, cream kitchen cabinets can be paired with practically any other color countertop, flooring or backsplash with great results. 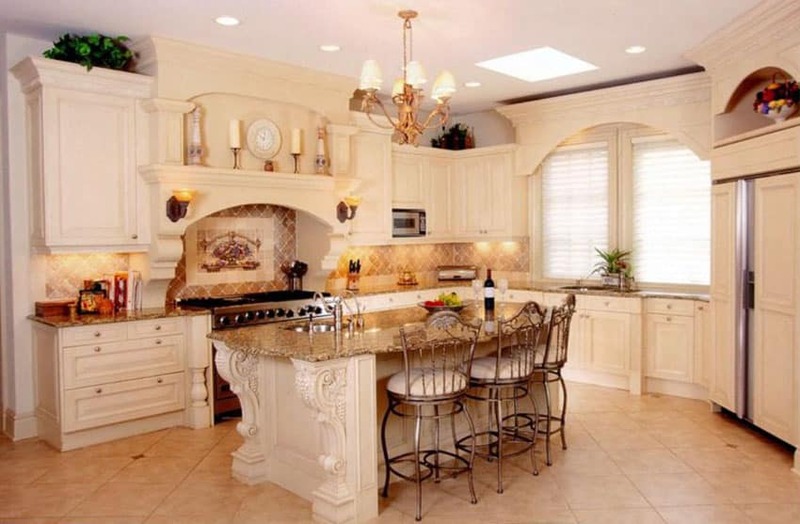 Here are some cream kitchen ideas for inspiration for your own interior designs. Cream is an oft underrated color for many homes. 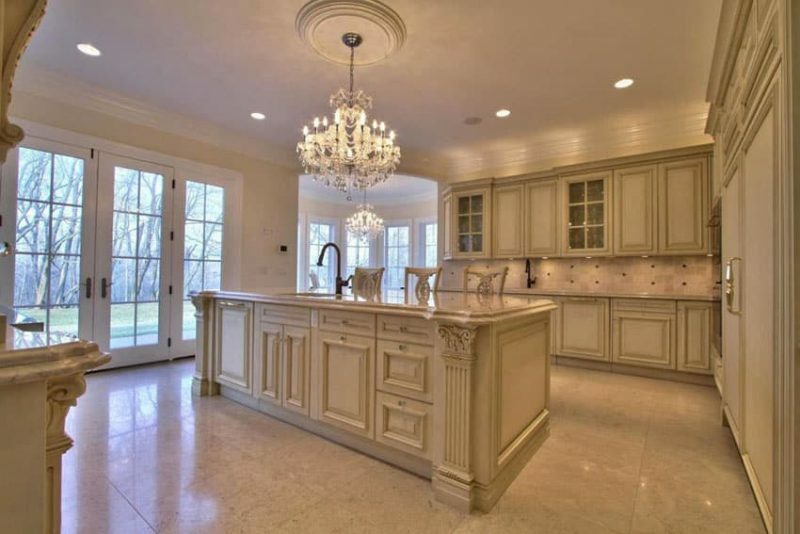 Almost synonymous with plain or traditional, what many home designers fail to realize is the elegance and versatility of using cream, especially the kitchen, one of the busiest spaces in the home. Because of its versatility, cream kitchen cabinets can be utilized for any style, from Traditional, Antique, Neo-Classical, Modern and even Futuristic designs. Acting as a great base color, usually for the cabinets, kitchens can be fitted with natural finishes such as wood and iron for a more country, barn or rustic look. It can be matched with pastel colors and light woods for a more cottage-like or traditional style kitchen, and can even be matched with stainless steel fittings or a bright accent color for more Modern and Futuristic designs. It’s also quite convenient that cream is available for many different materials and finishes, whether it be paint for wood panels, laminates over MDF boards, stone countertops, porcelain tiles for the backsplash and floor, or even the color of the centerpiece accent lamps. This variety in cream-colored materials and accessories gives it a wide range, allowing designers more flexibility when using it in their designs. 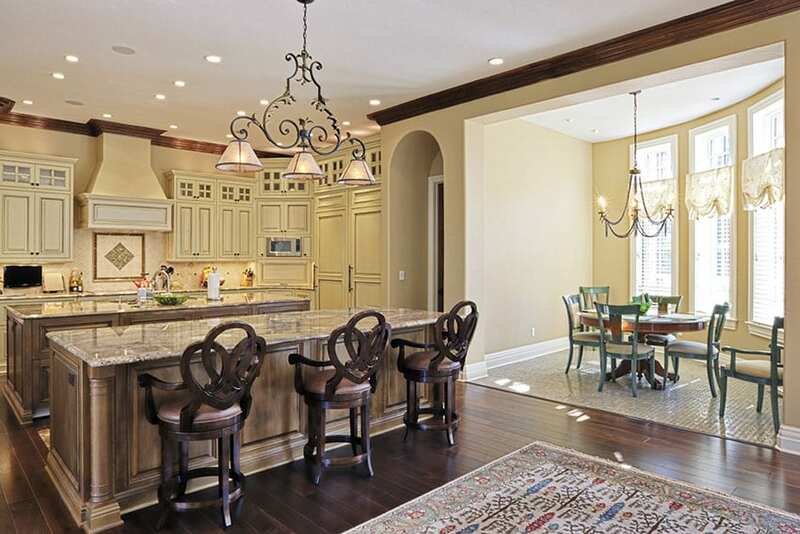 This beautiful cream-toned kitchen is well-accented with dark wood and wrought iron. 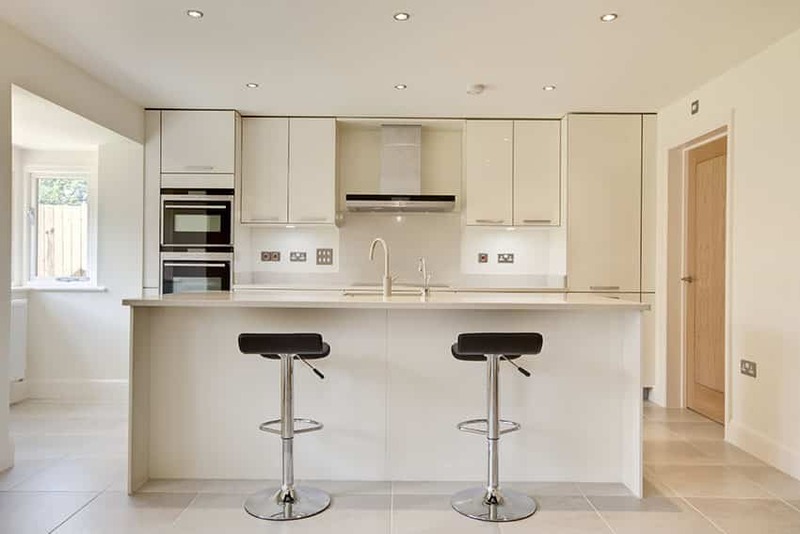 With all the cupboards in cream tones and raised panels, the cornices and floor planks are in a richer dark wood, as are the bases of the double kitchen island. Topped with rich brown granite, one island serves as the breakfast nook and is topped with an antique style tri-lamp pendant, while the other has a stainless steel wash basin. To the side, the small window dining nook is given a quaint charm by the knotted area carpet and white mullioned windows bringing in a lot of light. This traditional kitchen focuses on more classic, neutral colors, starting with the raised panel cabinets painted in a cream tone. The rest of the walls, subway tiles on the backsplash, and mullioned windows are in frosty white, providing clean, clear lines. The large Carrara marble countertop for the kitchen island also provides a neutral yet natural finish, while the rough-grained dark wood flooring provides more warmth. 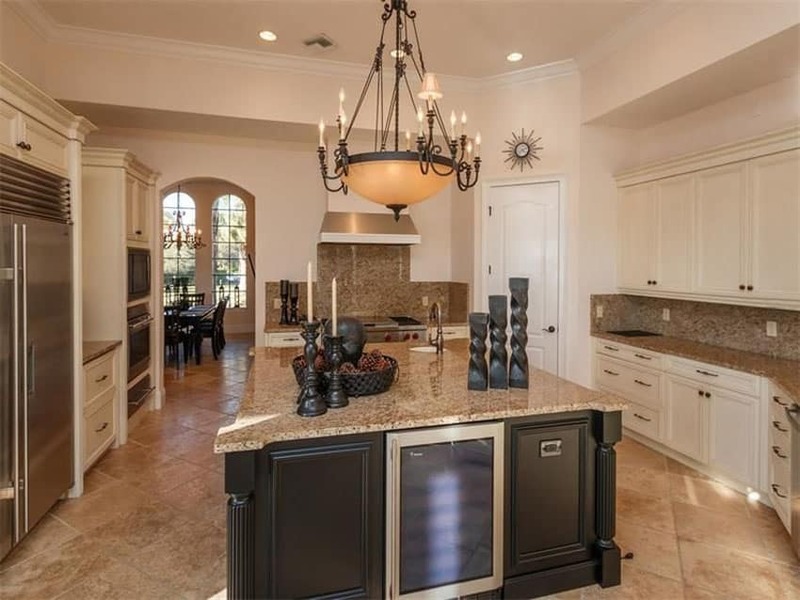 The lampshade candelabra over the kitchen island and by the window nook give warmth and an antique vibe. Many homeowners prefer antique white cabinets for a clean look in their kitchen. But by using an earthly pale cream color, a warm and delightful feel can still be achieved. 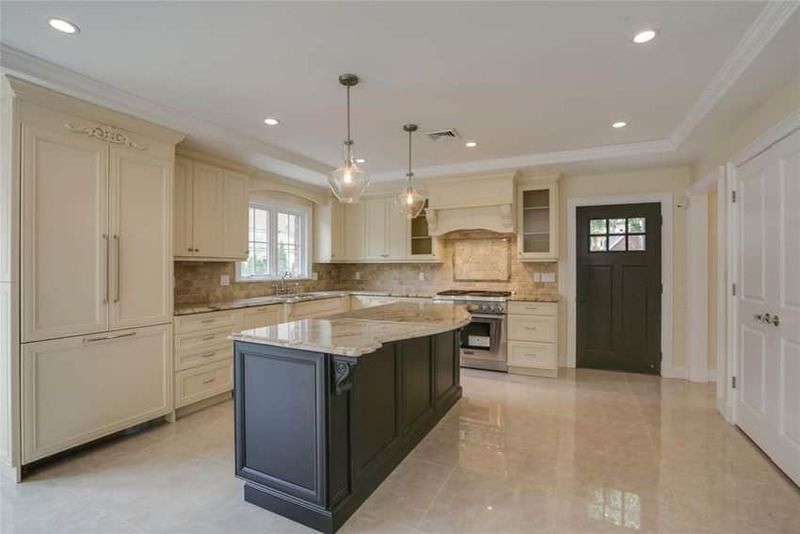 This luxurious kitchen features a massive wooden kitchen island in dark tone finish with beige granite top which extends throughout the counter cabinets. This classic design of the cabinetry, light beige ceramic tile backsplash and the use of natural stone floors adds elegance to this large contemporary kitchen. The stylish pendant lights over the island and the stainless steel appliances are the perfect accessories to incorporate to the design scheme. 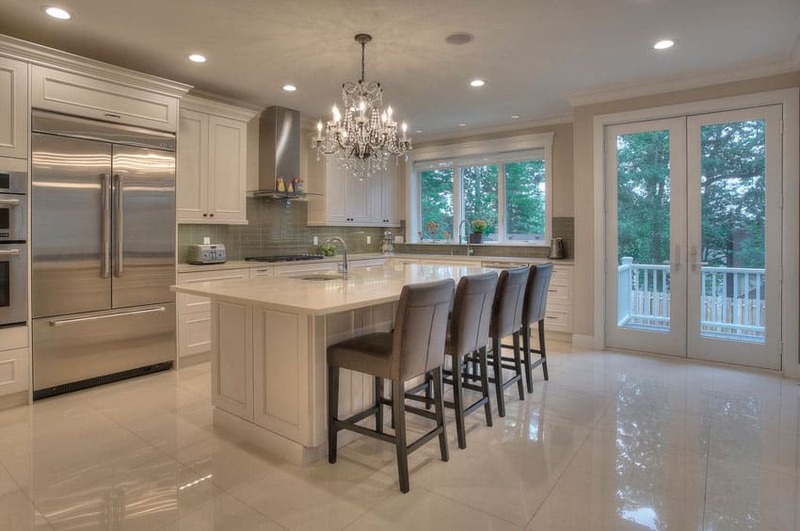 This kitchen features raised panel cabinets and mullioned glass cabinets in a nice off-white color, abruptly accented by the black granite stone countertop for the kitchen island. The walls running all around this U-shaped kitchen also features a cream and white patterned wallpaper, and the rough-grained wood planks used for the flooring tie together the whole space. 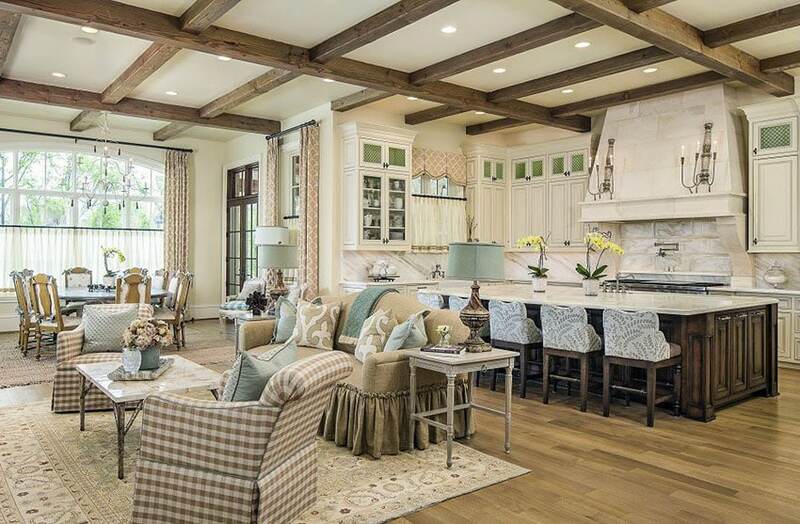 The ceiling also features exposed beams with refined white cornices. 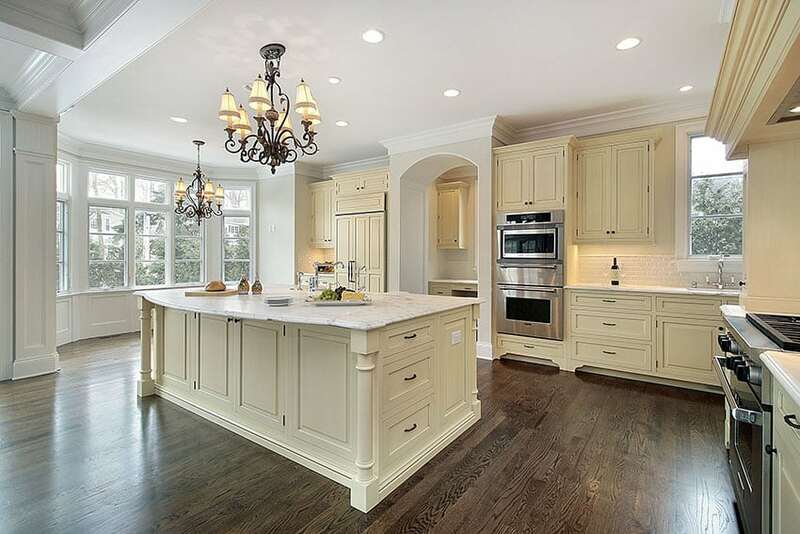 This traditional-style kitchen, with its raised panel cream-colored cabinetry and glass-mullioned shelves is bathed in a warm, golden light thanks to the warm white under cabinet lighting installed. Besides the beautiful glow it causes, under cabinet lighting is effective in lighting up task-heavy spaces on the black granite countertops. The small brown porcelain tiles for the backsplash are also used for the floor, and the large center kitchen island with hanging range hood provides a lot of space for cooking, food preparation, and even socialization. This modern kitchen features clean, linear lines and flushed cream-colored kitchen cabinets and drawers with minimalist chrome-finished handles. White was used for the base color of walls, the tiled backsplash and the white quartz countertops. Slim-lined chrome-finished fixtures and appliances also add to the modern vibe along with the black modern-style barstools and light wood finished door to the side. A plain beige tile used for the flooring ties the whole cream-colored modern kitchen together and provides warmth. 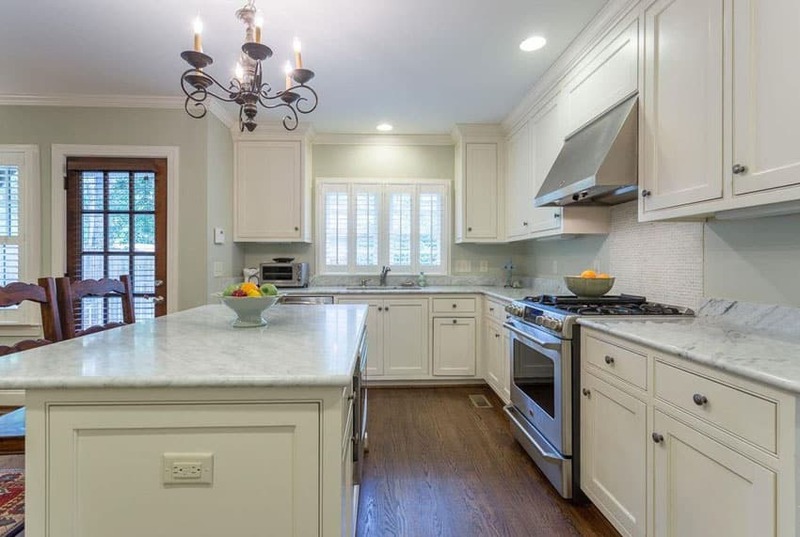 This traditional kitchen comes with cream-colored raised panel cabinets matched with an off-white subway tile backsplash lit by under cabinet lights. The countertops for the L-shaped kitchen is also in a beige stone finish, and is laden with the farmhouse style wash basin by the window, topped with an antique style wrought iron lamp. Warm wood fills in the lightness of the cream colors in the wooden floor planks, kitchen door and wood used for the decorated range hood and kitchen island base. The kitchen island’s countertop also comes in a bolder black soapstone. This classic kitchen features cream-colored raised panel cabinets and drawers with black metal handles that match the antique silhouettes of the black metal wash basin faucets. The backsplash and countertops also come in shades of beige, with a granite stone countertop and sandstone tiles for the backsplash. A darker wood tone was used for the strip flooring while an antique crystal and copper candelabra hangs over the L-shaped kitchen’s island bench. 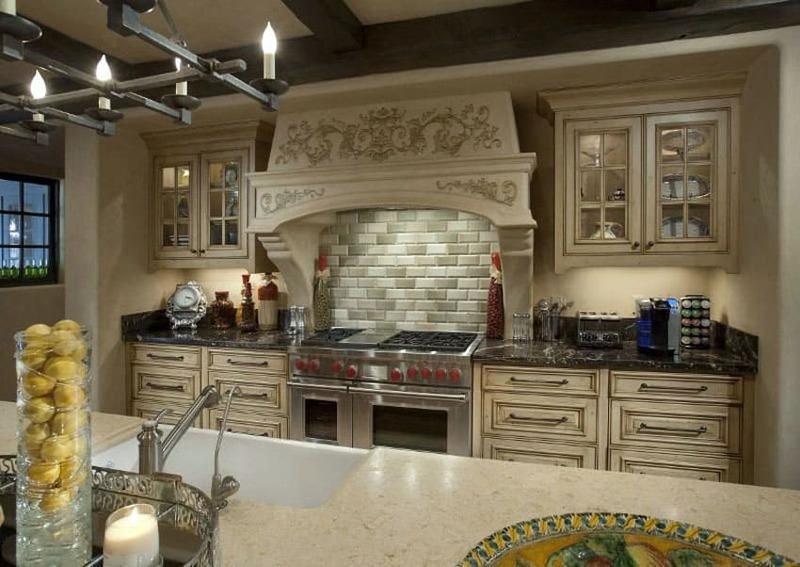 This Old Southern-style kitchen features beautiful vine carvings in-laid over the range hood’s decorative architrave centered over a stainless steel stove top with marble subway tile backsplash. 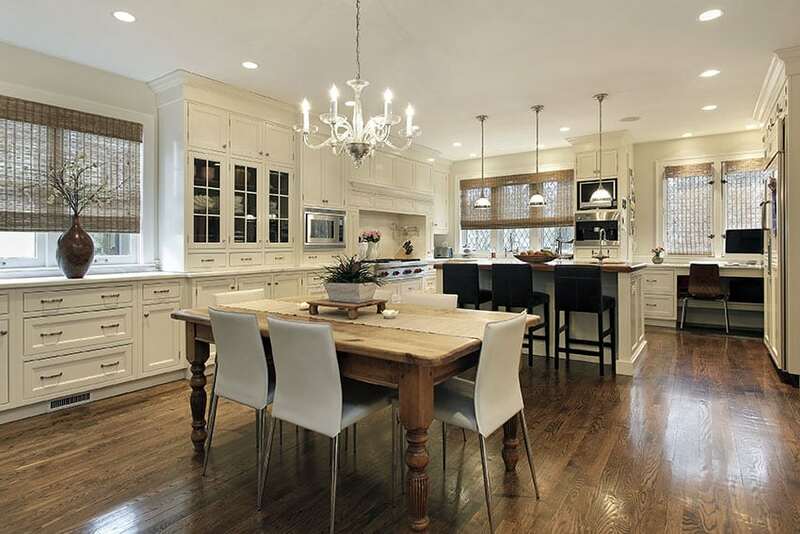 On either side are rusticated undercounter drawers and glass paneled hanging cabinets in a beautiful cream color. The countertop of this section is a polished black soapstone surface that is complemented by the beige granite stone used for the kitchen island that features a farmhouse sink. 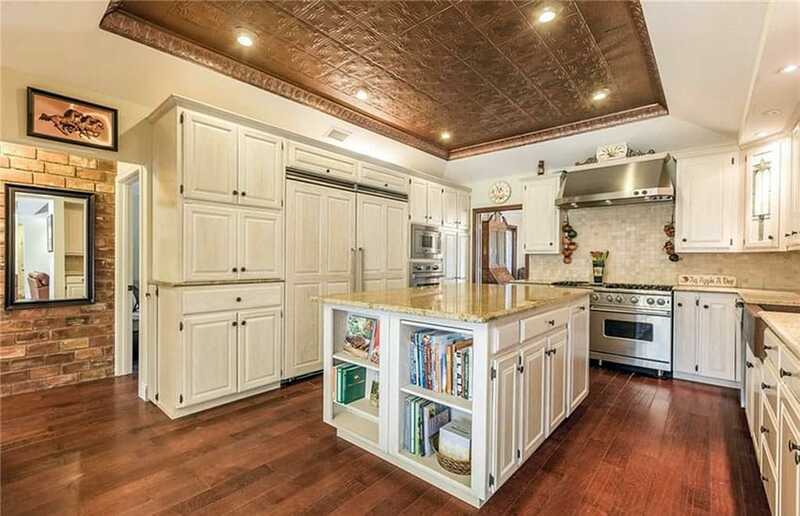 The kitchen’s ceiling has exposed beams treated with a dark wood stain that matches with the antique style cast iron lamp candelabra hanging over the kitchen island. This simple traditional kitchen starts off with an off-white shade for its recessed panel cabinets and drawers with small chrome-finished handles. The Calacatta marble countertops match with the small white and grey mosaic tile used for the backsplash as well as the slight green tinge used for the kitchen walls. A warm heavy-grained wood was used for the floor planks to act as a heavy element to the light colors all around the kitchen. 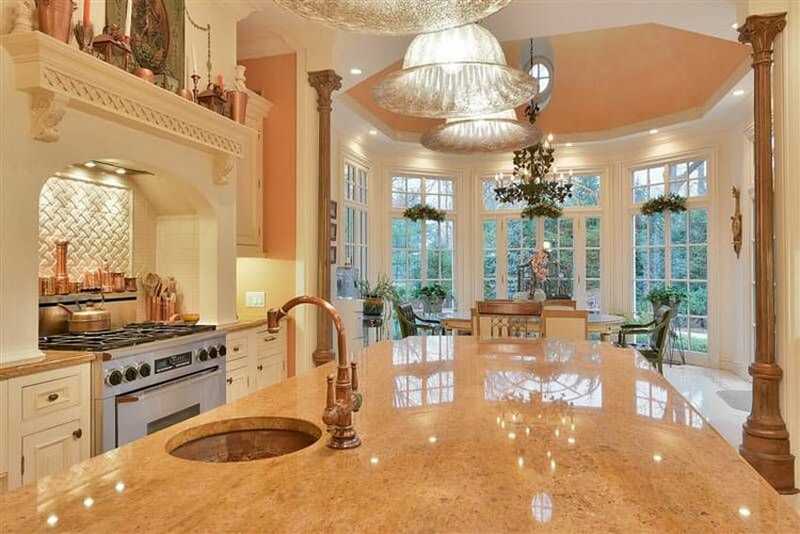 The kitchen isand is topped with an antique oiled brass chandelier. This rustic kitchen combines distressed olive green drawers and cabinets on the kitchen island with antiquated cream-colored raised panel cabinets and drawers on the wall mounted cabinets. The ceiling features heavy, exposed wooden beams in a dark wood finish and a hanging wrought iron decorative candelabra. 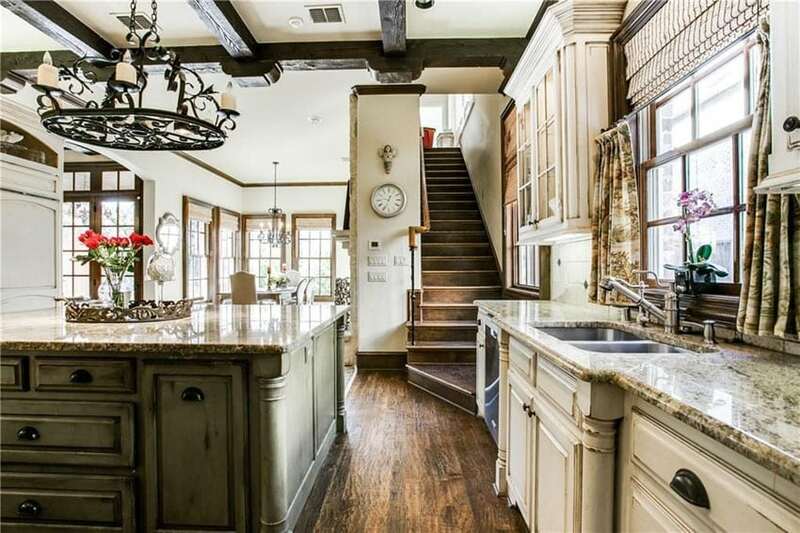 The two distressed wood casework bodied islands are topped with beige speckled granite countertops and are situated in a kitchen with dark, rough-grained wood plank flooring. The distressed look gives the design a reclaimed wood island style that offers elegance and character. 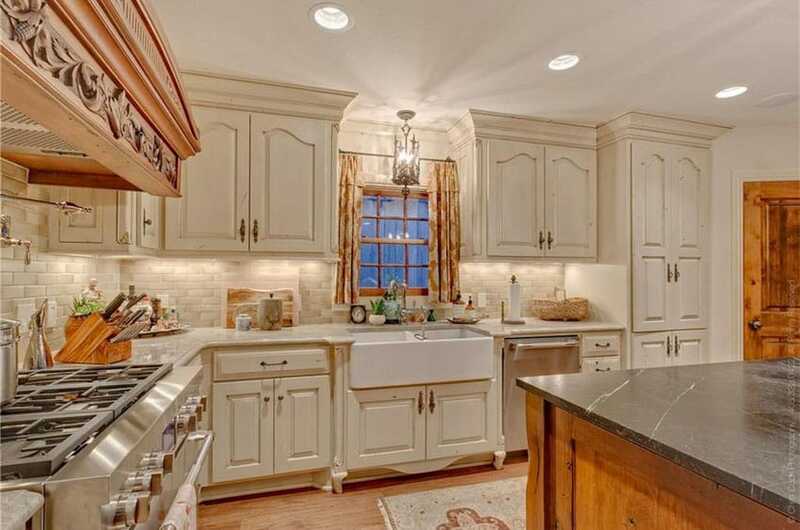 This traditional kitchen features beige-colored cabinets with raised panel farmhouse cabinets. Stainless steel appliances are recessed into the bulky casework, while white beadboard strips are in-laid under the kitchen island countertop in speckled beige granite stone. A beige sandstone tile is used for the kitchen backsplash and is featured as a larger tile for the flooring. The dark brown woven barstools add warmth and a tropical tone to the kitchen. This beautiful kitchen features a lot of copper accessories starting with the antiquated circular wash basin with matching counter-mounted faucet on the kitchen island. The kitchen island is also lit with a trio of frivolous antique glass pendant lamps and culminates in a black iron chandelier over the dining table by the large French window terrace. The cream-colored wood finish for the drawers and cabinets are also used in the plate rail with decorative scroll-shaped brackets over the range hood. Under that, warm white downlights illuminate a basket-weave tile backsplash. 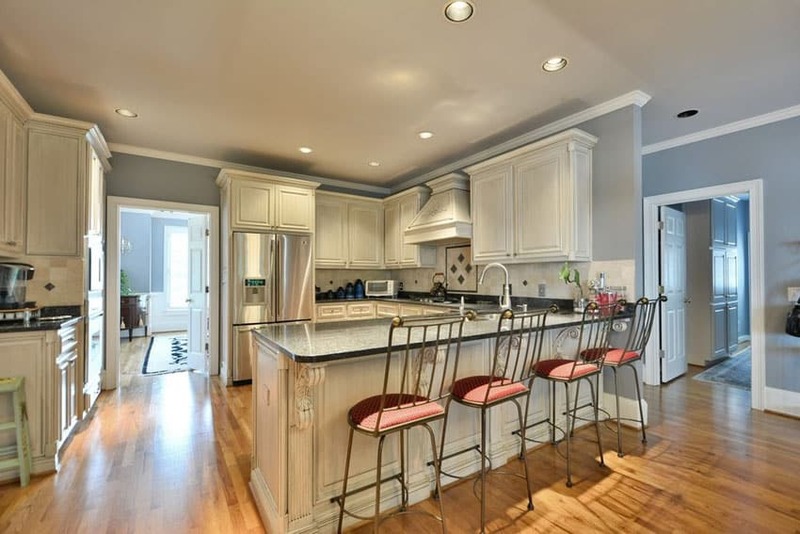 The raised panel cream-colored cabinets in this traditional style kitchen are in the same finish as the raised paneling and scroll-shaped brackets used in the kitchen island. The kitchen island is decked with four wrought iron barstools with red upholstery and faces a black granite stone countertop. The black countertop is countered by the bright cream-colored tiles used for the backsplash. The warm wood finish of the strip wood flooring brings warmth and light to the monochrome space. This traditional kitchen starts with a tri-level breakfast niche featuring white raised panel cabinetry and black quartz countertops used as a counter, breakfast bar and wash basin area. This area is topped with a pair of black industrial ceiling lamps. 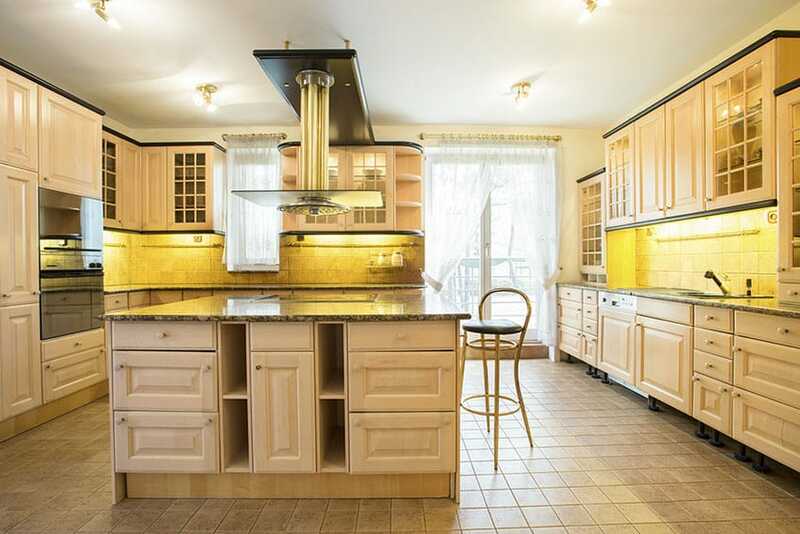 Separated by yellowish wood plank flooring, the other side of the kitchen features antiquated cream-colored raised panel cabinets, drawers and range hood cover with a mosaic tile backsplash. The center island also takes on a different tone, using a darker wood for its base and topping off with a beige speckled granite stone countertop. 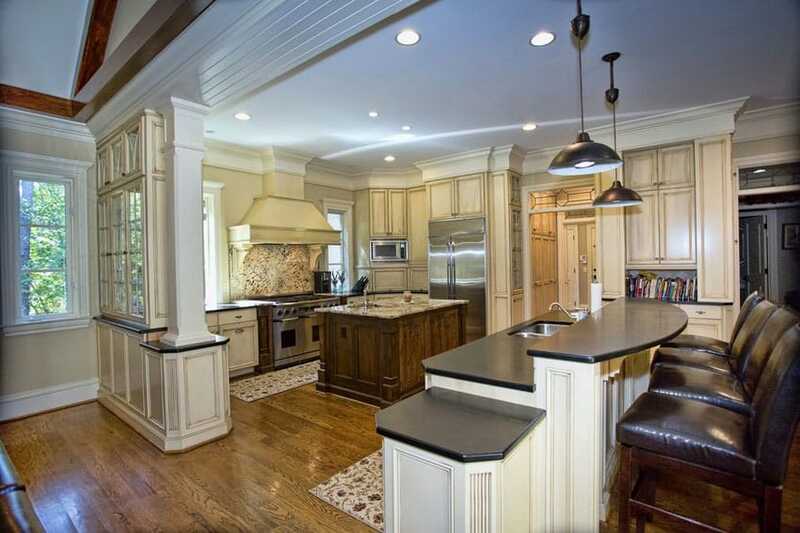 This traditional off white country kitchen comes with cream-colored raised panel kitchens and drawers. This finish was also used for the arched coves over the window and range hood and its accompanying plate rail above it. 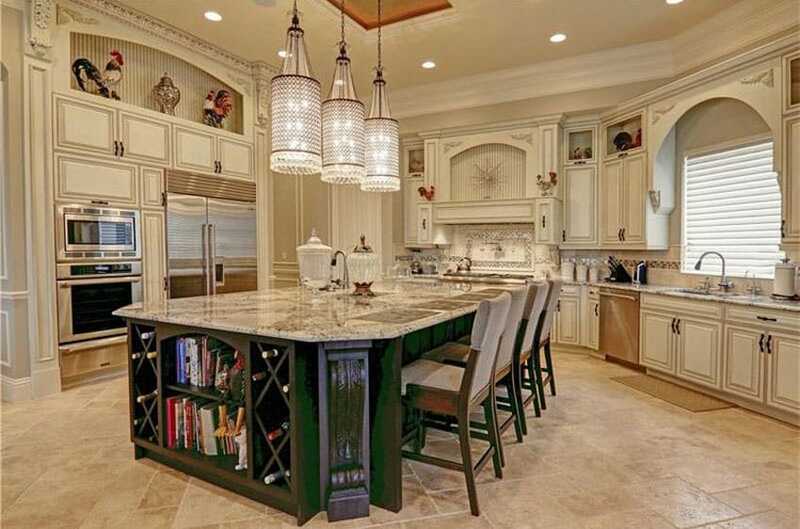 Also used on the decorative scroll-shaped brackets on the base of the beige speckled granite kitchen island countertop, the kitchen centers around a bronze lampshade candelabra hanging from the ceiling. To add warmth, a dark beige tile was used for the kitchen backsplash, while a lighter shade was used for the floor tiles. The kitchen island’s beige speckled granite countertop is held up by a dark wooden base with pedestals. 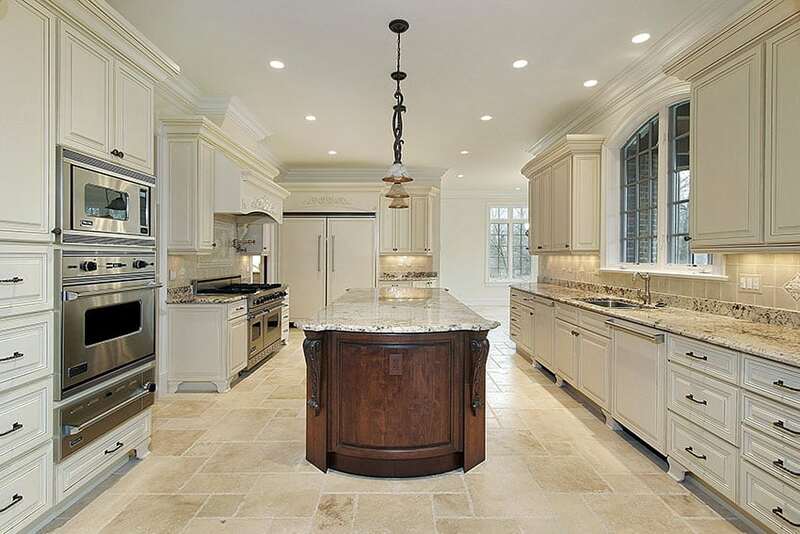 Although featuring the same speckled beige granite stone, the built-ups on the sides of the kitchen feature white raised panel cabinets and drawers and cream-colored walls. This speckled beige granite was also used for the backsplash and was offset by a lighter beige porcelain tile for the floors. 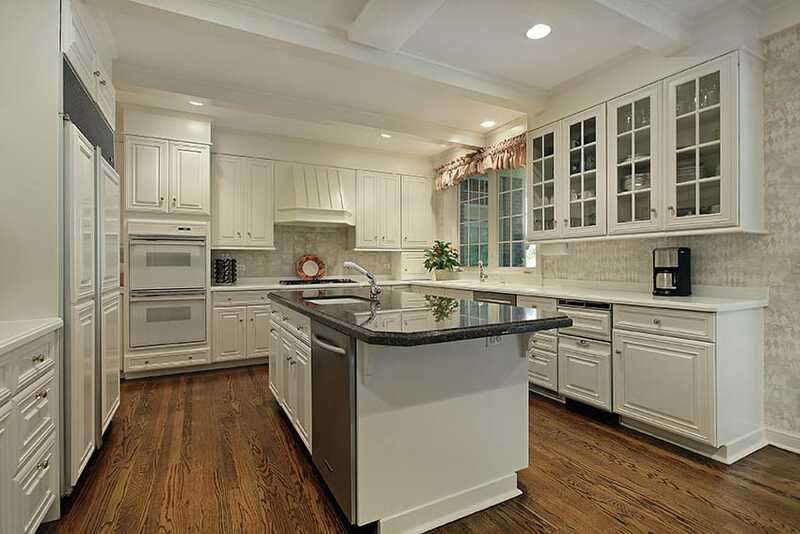 This u-shaped kitchen with cream cabinets has an integrated refrigerator and large beige granite counter island. Rich hardwood floors and a vintage bronze tray ceiling give this room a warm elegant vibe. Square cream color backsplash tile provide continuity and match the rooms overall design aesthetic. This Contemporary barn kitchen starts off with plain recessed panel cream kitchen cabinets and drawers with simple chrome-finished handles and cream-colored granite stone countertops for the back wall. The diagonally-installed white subway tiles on the backsplash, dark wood strip flooring, black stone countertop for the long kitchen island and its accompanying wood base in pale grey are barn-typical elements done in a Contemporary fashion. 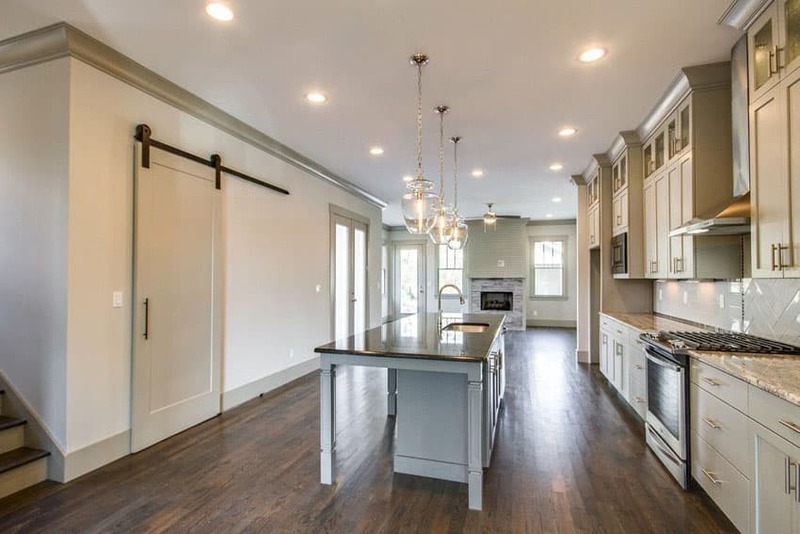 The minimalist sliding barn door with black metal rail and the trio of hanging bell jar pendants over the island further reflect this Contemporary barn aesthetic. 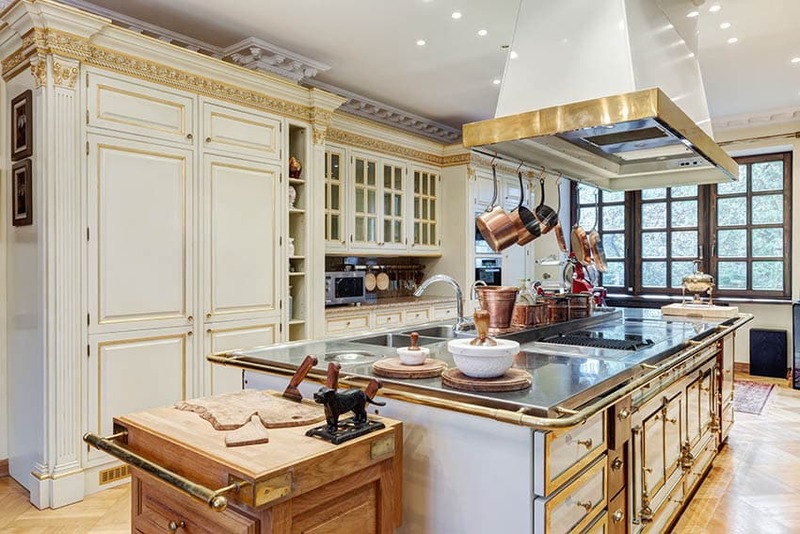 This French Provincial kitchen decked out with cream and gold gilded cabinetry makes an elegant statement. 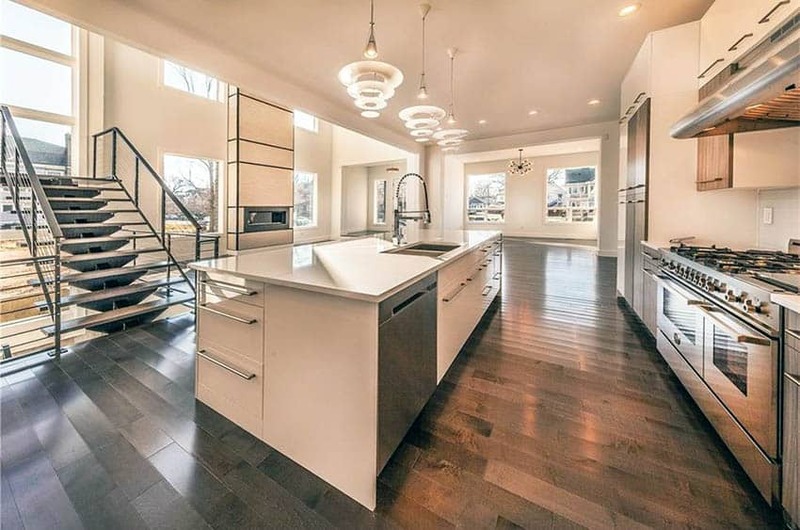 Glass door cabinets, hidden refrigerator, and custom range hood above a stainless steel topped island are just a few of the standout features of this design. 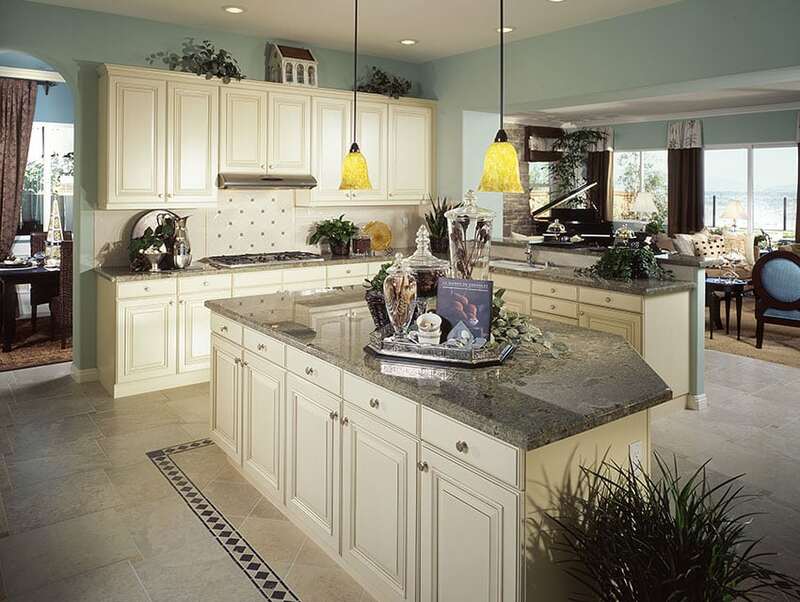 This modern kitchen showcase glossy cream cabinets with a quartz countertop and looped pendant lighting. Wood tile flooring throughout the space provides plenty of contrast. 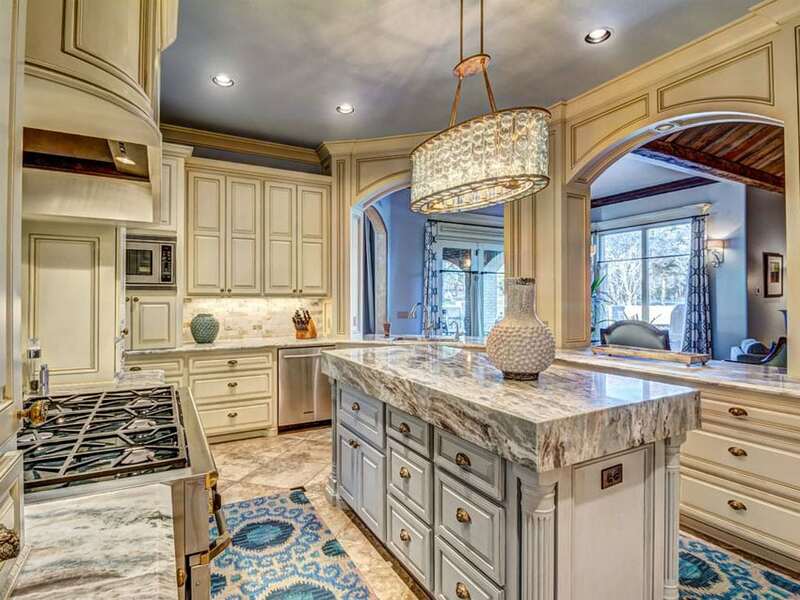 While high end appliances and an oversized kitchen island offer plenty og high-end luxury.